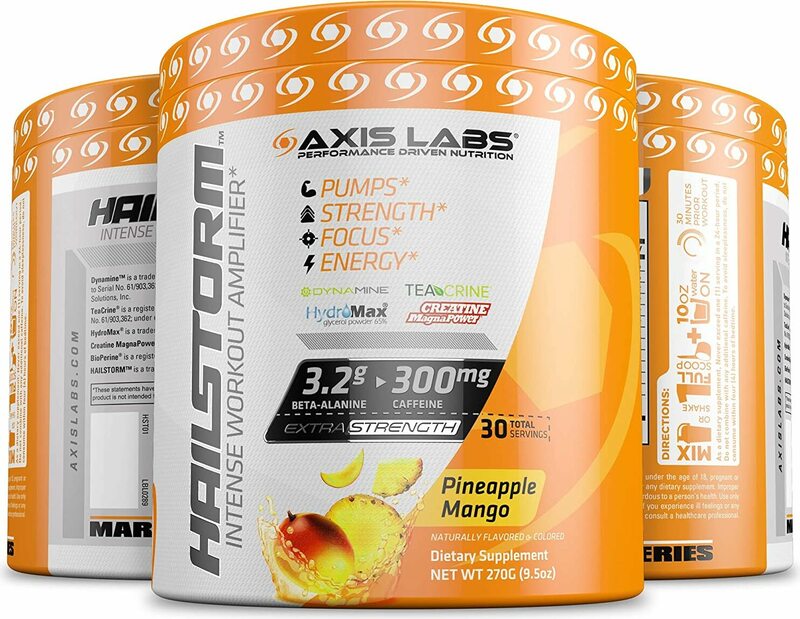 Axis Labs Hailstorm - Pumps! Strength! Focus! Energy! HAILSTORM incorporates a sufficient amount of CarnoSyn patented and purity-tested beta-alanine in order to increase the concentration of carnosine in your muscles. MagnaPower is a revolutionary chelated form of creatine (using magnesium) and is proven to be highly bioavailable. Creatine is arguably the most effective single sports supplement ingredient known to man, allowing you to do more work over a series of sets or exercises, leading to greater gains in strength, muscle mass and performance over time. Many supplement companies use bulk sourced creatine monohydrate which is often adulterated and impure. 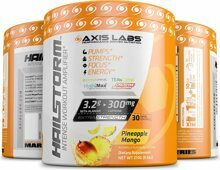 Axis Labs isn’t here to cut corners, so HAILSTORM gives you patented MagnaPower, which is tested and quality-controlled for maximum purity. HydroMax is patented high-potency glycerol - an organic polyol with beneficial properties in humans. After consuming glycerol, it is quickly taken up by skeletal muscles and attracts fluid, thereby promoting muscle fullness and better pumps during training. Be wary as many pre-workout supplements on the market use a cheaper form of glycerol called glycerol monostearate, which is often under 5% glycerol (rendering it useless for performance enhancement). Caffeine is a methylxanthine found in a variety of plants, especially tea leaves and coffee beans. HAILSTORM includes 300mg of caffeine per serving to satisfy even those who are highly tolerant to stimulants. Caffeine is one of the most well-researched stimulants, with evidence showing it can enhance athletic performance by quite a margin. In fact, research suggests that athletes who supplement with both creatine and caffeine before training are able to achieve 10% more peak power during training than those who supplement with only creatine. Dynamine is a patented, novel nootropic and blood flow enhancing ingredient providing high-potency methylliberine. Dynamine features gallate-enhanced oligomers derived from grape seed extract and green tea extract that promote vasodilation (expansion of blood vessels). Preliminary findings also show Dynamine also improves energy, enhances focus, and promotes better mood with a fast and intense onset of action. Be careful to not confuse Dynamine as being just another generic low-grade form of green tea extract or grape seed extract (which are rife in supplements these days). Instead, Dynamine is a unique ingredient that contains a proprietary mix of the most potent blood-flow enhancing fractions of green tea and grape seed extracts, including Peak G6. These compounds in Dynamine work by activating the enzyme responsible for synthesizing nitric oxide (NO), called endothelial nitric oxide synthase (eNOS). This enzyme is necessary for vasodilation and is the rate-limiting factor in determining whether or not NO can be synthesized. This makes Dynamine the ideal ingredient to take with other NO-enhancing ingredients, such as agmatine. TeaCrine is a patented form of theacrine, which complements the stimulatory nature of caffeine in HAILSTORM. Theacrine is methyluric acid and derivative of caffeine, working synergistically to increase major catecholamines. Research shows that theacrine boosts levels of dopamine and adrenaline, thereby promoting better focus, better performance, and better mood. Bioperine is a patented form of black pepper fruit extract, which helps promote the absorption, duration of action, and utilization of all other ingredients found in HAILSTORM.